I must tell you, despite the title of this entry being "Poseidon Adventure", it has very little to do with ships (although I was on a boat this week!) and almost nothing to do with the 1969 novel by Paul Gallico or the film adaptations in '72 and 2005. But it has everything to do with the voice-over for the trailer of the 2006's adapted film named Poseidon while Dida and I were in Barcelona. Easy to say, "poseidon" is actually a code word between me and my sisters for something else that sounds almost the same. Do not be fooled by the pictures. 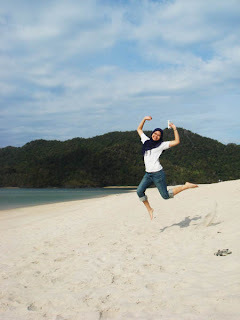 I jumped a LOT during the trip just to trick myself that I'm having fun. I've come to believe that my main purpose on Earth is to be an entertainer. Maybe not on a large scale (-yet!) but for my family, undeniably. Maybe it's a youngest-sibling thing but sometimes I do feel the pressure to lighten the mood, and silliness happens to be my speciality! 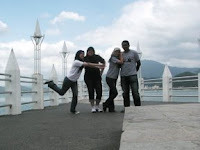 Goofing around at the Dataran Lang and imitating a tortoise at Tasik Dayang Bunting. This was actually our first trip together, but as expected.. the so called vacation was not as relaxing as a vacation should be. Let's just say that I know my family too well and everyone is too comfortable with each other to be THEMSELVES! hahahhaha! Our flight there was terribly delayed; we only get to eat dinner well after twelve and it amazes me that there were still stalls that wouldn't mind cooking for the eight of us at that hour. 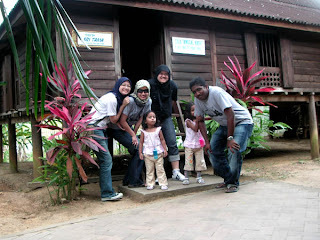 We had a little rest that night and headed to Kuah the next day. 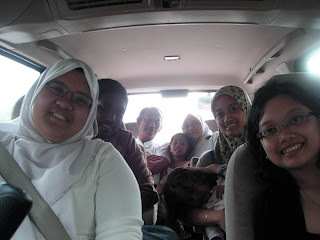 I don't remember much exactly what we did, probably just drove around.. went to the main tourists spots because Dida's never been to Langkawi. We had lunch at this curiously "famous" spot at the Kuah town (Sajian Murni) and really.. it was curious how that place is famous considering the food wasn't even particularly good. Let's just say that if THAT was "A", most food stalls around Shah Alam could get an "A plus PLUS"! For dinner, we went to Pantai Cenang.. to this very nice restaurant with amazing ambiance. Good lighting, awesome woodworks, AWFUL waiting time!! (Restoran Wakaf Samudera) I swear if the food server wasn't as good looking, I would've cursed and lost all my poise. heehee. At one point, my mom asked why it was taking them too long and apparently, three of their cooks had quit earlier that day so they were short-staffed. Even the managers were at the kitchen to cook the orders. Actually, I would've felt sorry for them if the price weren't SO STEEP!! But still.. that guy who works there.. really, were good looking! The next day.. now let me introduce you to the FUNKIEST (not in a good kind) meal I've tasted this year. 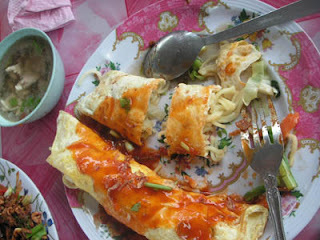 It is called Mee Gulung or "wrapped noodles". Basically they're noodles with some veges, wrapped in egg slathered with chilly sauce and accompanied with a soup that didn't match the bland-yet-odd taste of the noodles at all!! I think I'd rather die than have them for breakfast, lunch and dinner. We (the younger adults) sent the parents to get a massage for an hour so WE could gossip about them for an hour! heh. We went to the beach as we decide on a plan for the rest of the day. After the hour was up, we went to The Loaf and I cannot find anything really bad to say about it. I love bread! Sandwiches.. buns.. pies.. Any open claims of dislike would be a form of disloyalty and I wouldn't want that! heehee. After refuelling on something that I actually like, Dida and I decided to go up the hill to see Telaga Tujuh. Just halfway through the steps. that the Seven Wells are waaaaaaaayyy up the hill and that the stairs ended at one-fifth of the hill! Our knees were on the verge of falling off their sockets but it was a proud moment; to have achieved going up to those last steps. So we didn't get to see the wells.. just the very nice waterfall at the top of those flight of steps. We managed to get back down without any slip (despite that it had rained earlier) even with our obviously-seldom-worked legs. Then IT happened -- at the base of the hill with the supposedly-proper walkway which had been covered by moss.. I freakin' FELL!! hahahhaha! I laughed ('cause that is my first response to most things anyway) and then cursed 'cause the moss had stained my jeans. We got back to the hotel to have a bit of rest before going out again. That night we decided to be smart and have KFC for dinner! hahahhahaha!! We went blog-hopping the next day! whoops. I meant ISLAND-hopping. I was cranky 'cause I didn't get as much sleep as I'd wanted and that I didn't have enough time to get a proper hotel's breakfast. But my mood completely changed once we got on the boat! For one, the ride was too nerve-wrecking to stay in silence and two, it was also too funny to not laugh out loud! Everyone was making funny noises everytime the boat hits the water too harsh. 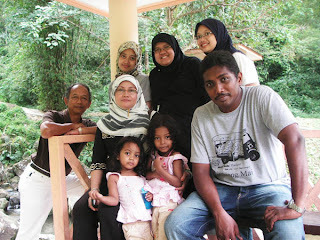 We went to Tasik Dayang Bunting first -- more STEPS! 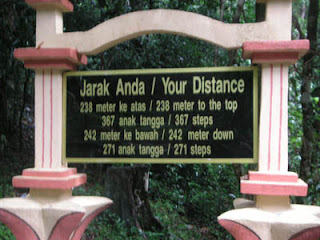 I was nervous a little but comparing to the steps to Telaga Tujuh, the one to the lake was nothing! 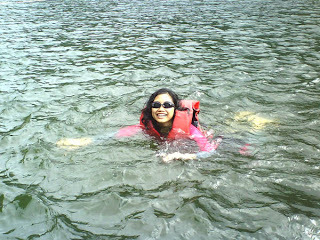 Only me, Dida, Abang Min and the kiddies went into the water. Even then we all had our safety jackets! 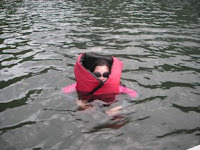 I know that probably sounds pathetic but I figured that drowning is an awful way to die. And in front of your family?? sigh. That just makes it worse. I just couldn't bring myself to gamble a swim in 30-metres-deep lake. After a few hours out in the ocean, we were all famished and ready to get some food! We drove (well, Dida really) to Kuah and went to this place Dida's friend had suggested; Bamboo Beach Restaurant and here I shall say.. 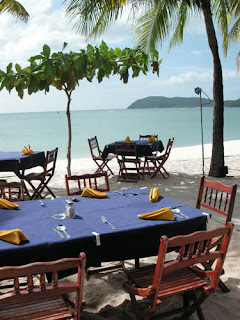 IT WAS THE BEST RESTAURANT IN LANGKAWI!! Incredible food, beautiful scenery, outstanding service! It was also relatively cheap than the other restaurants we've been to. We got two ikan bakar.. tom yam, udang goreng tepung (3 dishes of 6 prawns on each -- I practically ate one dish by myself!! ), two dishes of veges.. we were MONSTERS! Starving monsters! The waitress came over to our table a couple of times just to make sure that we had really asked for a third dish of the prawns. hahhaha! It was well worth it and satisfying. At least we have ONE memory of excellent food while we were on our trip. 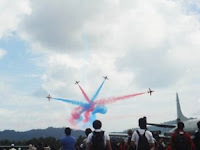 We went to see LIMA '07 on our final day in Langkawi. 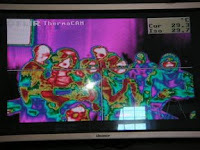 There wasn't anything really interesting in there except for the stealth cameras. (Is that what it was called?) If you must know, I'm not even into cars so looking at a plane's engine or their replicas isn't exactly my idea of having fun, but those cameras really got my attention! 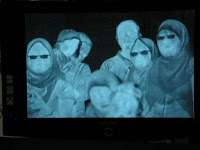 The heat-sensor camera and thermal night sight. It'd never crossed my mind that I was actually.. hot! hahaha! 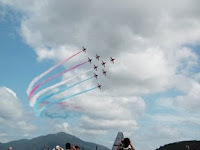 The air show was really neat! They were impressive and Dida likes to say that the pilots were cocky for showing off what they can do. Well, they were actually but I suppose they deserve to be cocky! The stunts that they did were incredibly gutsy! Don't be fooled by the captivating scenery.. 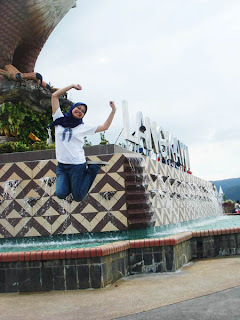 If you're ever going to Langkawi.. SAVE YOURSELF!! Don't - go - to - this - effing restaurant!! We have agreed that it was the worst restaurant of the lot! Stupid service; borderline moronic and an absolute time-waster!! The food was fine, but JUST fine.. nothing really special about it except for the appearance of the food when they finally arrived at the table! It boggles my mind how Jalan-jalan Cari Makan have been there! Obviously the host simply went to places that they were sponsored to! The waiter (singular) was unattentive when he was taking orders but doesn't mind eaves-dropping to our faint attempts at lightening up the mood making jokes. We must be having the most awful luck in the F&B department somehow. Just to tell you how bad the waiter really was, when I asked for spaghetti bolognaise, he had to come over to my seat, look into my menu, even pointed at the words "Bolognaise sauce" and mumbled to himself, "bolognaise.. bolognaise.." Like the snob that I am, I had to scoff! I'm sorry if he can't spell B-O-L-O-G-N-A-I-S-E but he works in a restaurant for God's sake! He should know what's on the menu!! And we're running LATE!! There was another guy who took AGES to get our bill and EVEN LONGER to work the credit card machine. Dida sped like there's tomorrow from the stupid restaurant towards the hotel (to get our luggages which weren't completely packed) and even faster towards the airport! Our flight was at 5:35pm and we got at the check-in counter at 5:25pm. Crazy, right? My mind was racing about what we'll do if the man at the counter refuses to check us in; should we beg? We were late (curses the Lighthouse under breath) but we're here now! We were sorry, although not as sorry as those morons at Lighthouse should be! He nags a little, told us that we should have got there at least an hour before the flight. That he's not supposed to let us through -- but he did! Just 10 minutes before the flight!! hahahhaha! We were damn lucky for managing to catch the flight back. I was sort of miffed that the flight was on time.. How is that fair? At times when we got to the airport early, the flight was delayed.. on the very rare time that we ran late, the flight decided to be on time! geez! So anyway, now we're back in Shah Alam and I should be able to update you with my unexciting life like always again..
hahahha! scenery mmg best anaa.. tapi service dia sangat terookk! !